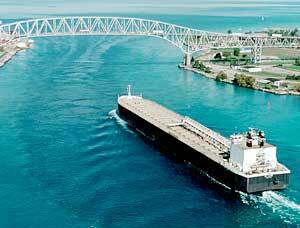 The M/V St. Clair is named in honor of the Great Lakes port of St. Clair, MI. The M/V St. Clair was built by Bay Shipbuilding Corp at Sturgeon Bay, WI and entered service in May 1976. The vessel remains the largest hull to be side-launched on the Great Lakes. The M/V St. Clair is powered by three 3500 HP General Motors Electro Motive Division (EMD) diesel engines. The vessel uses a twin conveyor system below its cargo holds to transport cargo to an inclined conveyor belt that elevates the cargo to the deck-mounted boom conveyor. For maneuvering in port, the vessel is equipped with 1,000 HP bow and stern thrusters. The M/V St. Clair is used for the long-haul transport of iron ore pellets, coal, and limestone on the Great Lakes. Midsummer Draft (MS) 30'- 5/8"